Stephen Hawking enters the recent debate around black holes and firewalls – by suggesting event horizons may not exist! Dr Tony Padilla and Professor Ed Copeland discuss Hawking’s recent paper. World-renowned physicist Stephen Hawking has conceded that he was likely wrong about his view that the Higgs boson doesn’t exist — an outcome he doesn’t find very exciting. Speaking at the Beckman Auditorium in Caltech, Pasadena, Calif., on Tuesday (April 16), the British physicist who is famous for developing the theory behind evaporating black holes gave a public lecture on “The Origins of the Universe,” summarizing new revelations in modern astrophysics and cosmology. The auditorium was full and hundreds of fans poured onto campus to watch the “physics superstar” give his lecture on a huge screen set up on the lawn outside Beckman. Hawking honed-in on the question “why something rather than nothing?” reasserting his point of view that a supernatural “god” is not needed to create the universe — quantum fluctuations helped shape our evolving universe at the Big Bang, adding the conditions were “just right” for life (and therefore us) to be asking these profound questions. Hawking believes the answer to this big question lies in M-theory, an extension to superstring theory, and that the Large Hadron Collider (LHC), located on the Franco-Swiss border near Geneva, Switzerland, could start detecting hints of supersymmetric particles in the not-so-distant future. 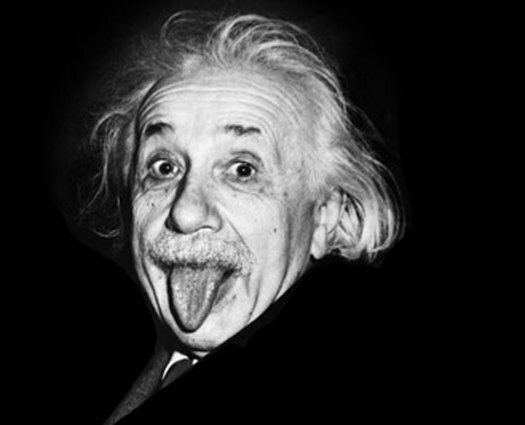 Although much of the discussion was based around black holes, multiverses and the apparent incompatibilities of Einstein’s general theory of relativity and quantum mechanics, he did have some time to comment on the recent discovery of the much-sought after Higgs boson. 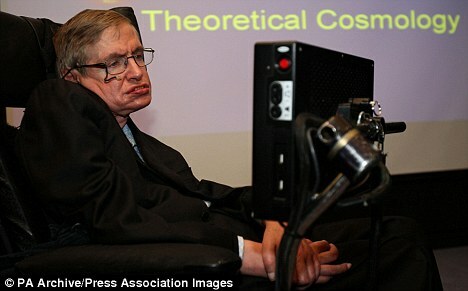 “It looks like I’ve lost another bet,” Hawking joked during his presentation to the capacity audience. 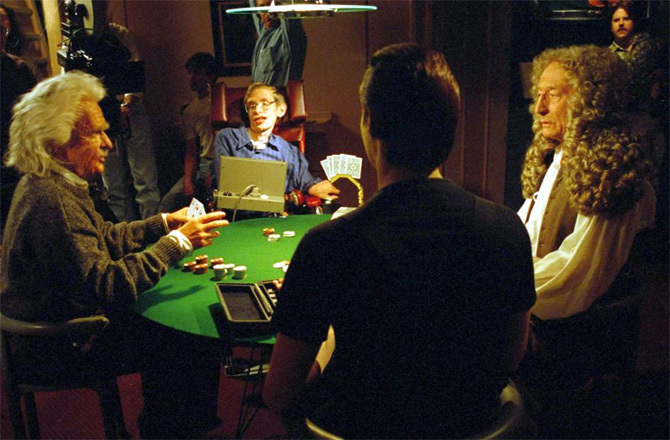 Hawking famously placed a $100 bet against fellow physicist Gordon Kane of Michigan University on the Higgs boson not being discovered. But shortly after CERN announced that the LHC had discovered a “Higgs-like particle” on July 4, 2012, he admitted the odds of him winning the bet had become very slim. He reaffirmed this disappointment at Tuesday’s Caltech lecture, saying that although the world was wrapped up in excitement for the Higgs boson discovery, he “didn’t feel the same” — a sentiment shared by many of his colleagues…..
We humans haven’t changed much since our remote ancestors roamed the African savannah. Our brains evolved to cope with the human-scale environment. So it is surely remarkable that we can make sense of phenomena that confound everyday intuition: in particular, the minuscule atoms we’re made of, and the vast cosmos that surrounds us. Thanks to powerful telescopes, and to instruments such as the Large Hadron Collider in Geneva, we can map billions of galaxies, and trace cosmic history back to some mysterious “beginning” nearly 14 billion years ago. But as always in science, each advance brings into focus some new questions that couldn’t previously have even been posed. In a new three-part series for the Discovery Channel, Stephen Hawking’s Grand Design, my old friend and colleague explores some of the biggest issues in science today – in particular, how close we are to arriving at a “theory of everything” that explains the final mysteries of the universe. But the mystery is even deeper. For, as I argued at a Royal Society debate last week, there’s an equally fascinating question: namely whether we, as humans, will ever be able to understand our cosmos and the complexities within it. We’ve known for a long time that, when confronting the overwhelming mystery of what banged in the Big Bang and why it banged, Einstein’s theory isn’t enough. That’s because it treats space and time as smooth and continuous. We know, however, that no material can be chopped into arbitrarily small pieces: eventually, you get down to discrete atoms. Likewise, space itself has a grainy and “quantised” structure – but on a scale a trillion trillion times smaller. During the very earliest instants after the Big Bang, everything was so immensely squeezed that this “graininess” is crucial. But theorists are still baffled about the bedrock nature of space and time on the very smallest scale: in the fashion of ancient cartographers, we must still write: “Here be dragons. On the largest scale, we may be even further from grasping the full extent of physical reality. The domain that astronomers call “the universe” – the space, extending more than 10 billion light years around us and containing billions of galaxies, each with billions of stars, billions of planets and maybe billions of biospheres – could be an infinitesimal part of the totality. Indeed, the results of our Big Bang could extend so far that somewhere there are assemblages of atoms in all possible configurations and combinations – including replicas of ourselves. And that’s not all. “Our” Big Bang may not even be the only one. An idea called “eternal inflation”, developed by the Russian cosmologist Andrei Linde, envisages Big Bangs popping off ad infinitum, in an ever-expanding cascade. This process depends on the physics that prevails at ultra-high densities: there are genuine prospects that physicists may, in the coming decades, be able to pin down the relevant equations well enough to be able to infer whether the prerequisites for eternal inflation are indeed fulfilled – and whether our universe is just one island in a vast cosmic archipelago. This cosmic environment would be on scales so vast that our purview would be restricted to a tiny fragment: we wouldn’t be directly aware of the big picture, any more than a plankton whose “universe” is a spoonful of water is aware of the Empire State Building. The question then arises of what these other universes are like. By analysing cosmic light, we can infer that the atoms in distant stars behave just like those we study in the lab. But does this uniformity extend beyond our horizon? 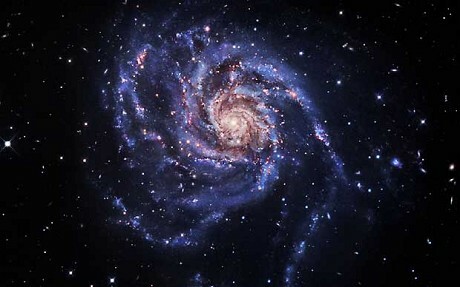 The most comprehensive theories – known as M-theory, and pioneered by Ed Witten, the undisputed leader of this subject – suggest that the answer is no, and that the wider cosmos might display immense variety, with different universes being governed by different bylaws. Were this the case, our universe would belong to the subset where there was a “lucky draw” of cosmic numbers conducive to the emergence of complexity: life couldn’t exist if gravity were overwhelmed by an overly strong repulsive force, nor if there were no atoms, nor if there were insufficient space and time for complexity to emerge. During a recent conference at Stanford University, some theorists investigating this concept of a multiverse were asked how strongly they believed in their ideas: would they bet their goldfish? Their dog? Themselves? I said that I was about at the dog level. Linde, however, was far more confident – after all, he’d devoted 25 years of his life to eternal inflation. The great theorist Steven Weinberg later commented that he’d happily bet Martin Rees’s dog and Andre Linde’s life. I think Stephen Hawking, who’s been known to make a bet or too, would place the same wager. To prove or refute these conjectures – to turn them into firm science – we need to achieve the unified understanding that Hawking and Leonard Mlodinow call the “Grand Design” (after which the new series is named). Success, if achieved, would triumphantly conclude an intellectual quest that began with Newton, who unified the force that made the apple fall with the force that held the moon and planets in their orbits. The quest continued through the insights of Faraday and Maxwell, who unified electric and magnetic forces. M-theory and rival ideas, are not necessarily confronting the biggest challenges. Suppose you’d never seen chess being played. You could, by watching a few games, infer the rules. But learning how the pieces move is just the start of the absorbing progression from novice to grandmaster: the beauty of the game lies in the rich variety that the rules allow. Likewise, the Grand Design would be irrelevant to the 99 per cent of scientists who are neither particle physicists nor cosmologists, and who are challenged by the baffling complexity of our everyday world. It may seem incongruous that scientists can make confident statements about remote galaxies, or about exotic sub-atomic particles, while being baffled about issues closer to hand – diet and disease, for instance. Yet even the smallest insects embody intricate structures that render them far more mysterious than atoms or stars. Nearly all scientists are “reductionists” in so far as they think that everything, however complicated, obeys the basic equations of physics. But even if we had a hypercomputer that could solve those equations for (say) breaking waves, migrating birds or human brains, an atomic-level explanation wouldn’t yield the enlightenment we really seek. The brain is an assemblage of cells, and a painting is an assemblage of chemical pigment. But in both cases, what’s important and interesting is the pattern and structure – the emergent complexity. This is why the Grand Design has no relevance to most of the things that humans value. True, if you believe God is some magician who lit the blue touchpaper to set our universe expanding, you need to modify your beliefs. But nothing in modern physics – and here I disagree with Hawking and Mlodinow – need give Rowan Williams (for instance) any intellectual discomfort. Will scientists ever fathom all nature’s complexities? Perhaps they will. But we should be open to the possibility that we might, far down the line, encounter limits – hit the buffers – because our brains don’t have enough conceptual grasp. As I remarked earlier, it’s amazing that we can comprehend so much of the counter-intuitive cosmos. But there may be some aspects of reality are intrinsically beyond us – just as quantum theory was beyond the first primates. Here, we astronomers can offer a special perspective. Our biosphere, as everyone bar the creationists accepts, is the outcome of several billion years of Darwinian evolution. But astronomers are mindful that the future is potentially far longer than the past. Our Sun formed 4.5 billion years ago, but its fuel won’t run out for another six billion years. And the expanding universe will continue – perhaps for ever. Future evolution, here on Earth or far beyond, could be as prolonged as the Darwinian process that has led to us – and even more wonderful. Whether the really long-range future lies with organic post-humans or with intelligent machines is a matter for debate. But we would be anthropocentric to believe that all of science is within humanity’s grasp, and that no enigmas will remain to challenge our descendents. There may be things that humans will never understand – but that doesn’t mean that they will never be understood. 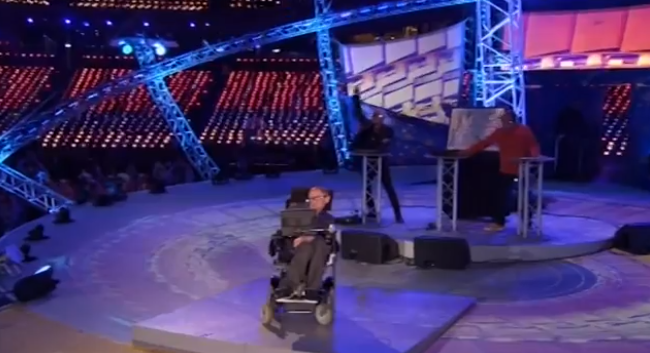 Stephen Hawking appeared onstage with Orbital for a moving rendition of “Where Is It Going?” during the Paralympic Games opening ceremony Wednesday night in London. Suddenly, the graceful, expansive “Where Is It Going?” morphed into the aggressive stomper “Spasticus Autisticus” by Ian Dury. The late singer, who became crippled after contracting polio at a young age, wrote the song in the early 1980s to protest what he perceived as patronizing treatment of the disabled; the song was subsequently banned by the BBC. If the video of the performance doesn’t make you shed a tear about the wonders of science and the triumphs of humankind, then, well, nothing will. Scientists are working out a way to ‘hack’ into Stephen Hawking’s brain to enable him to communicate more easily. The world-famous physicist has been trying out the ‘iBrain’ which picks up his brain waves and sends them to a computer for analysis. Hawking was fitted with a black headband which has a series of neurotransmitters inside it and was told to think about scrunching his right hand into a ball. He was able to create a pattern which the researchers hope they can one day convert into letters, words and sentences. He famously uses a computer to communicate with a robot-like voice which he until seven years ago he used to activate by a clicker. Now because the muscles in his hand are too weak an infra-red sensor superglued to his glasses monitors his cheek movements which are translated into text by a computer on his wheelchair. The iBrain has been developed by Philip Low, a professor at Stanford University in the US. It is about the size of a matchbox and is very light so does not weigh down Hawking’s head. Professor Low said he hopes that it will be able to monitor him in real time, regardless of what he is doing. He said: ‘We’d like to find a way to bypass his body, pretty much hack his brain. ‘This is very exciting for us because it allows us to have a window into the brain. ‘We’re building technology that will allow humanity to have access to the human brain for the first time. Mr Low will unveil his latest findings next month at a conference in Cambridge, and Hawking may demonstrate the technology. It could also be used to treat sleep disorders and possibly help to quickly diagnose autism.